The Nuratau State Nature Reserve was established in 1975, however, its scientific department was staffed only beginning the autumn 1977. The main directions of the ornithological studies in this nature reserve are the inventory of the species composition, study of the ecology and biology of rare birds and monitoring of the nesting birds of prey. The first scientific associates, from 1977 to 1986, were the married couple, Evgeny Nikolaevich and Elena Nikolaevna Korshunov. They studied the species composition of the avifauna of the Ridge Nuratau, the ecology, biology and quantitative composition of nesting birds of prey and Passeriformes birds. However, zoological material collected in that period was lost in 1987, when the office of the nature reserve moved to a different place. Only the herbarium of those years was fully preserved. Besides, there were no associates in this nature reserve in 1987; therefore, no studies were carried out. From 1990 to 1993, an ornithologist, Marat Faridovich Biserov worked at this nature reserve. He carried out studies on the ecology of birds of wood-and-shrub biotopes of Nuratau Nature Reserve. Practically, the whole material in the ornithological material was collected by him. In 1990-1991, the ornithological studies entitled "Space-time structure of the avian population in the Nuratau Ridge and adjoining foothill desert (zoogeographic and individual solution of problems). Phenology" were carried out by a scientific associate, Elena Aleksandrovna Medvedeva. She also made a contribution to the enrichment of the ornithological collection (nine skins). 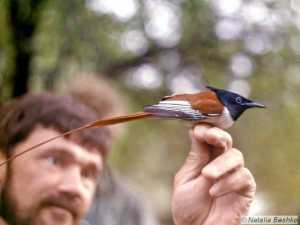 Currently, the ornithological collection of the Nuratau Nature Reserve numbers 274 skins of 52 species. 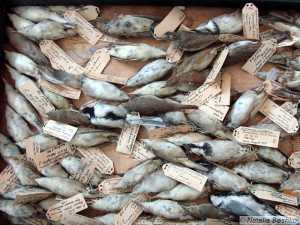 Of these, Passeriformes numbers 270 specimens of 49 species of 16 families; Columbiformes - 2 specimens of 2 species and 2 specimens of Strigiformes. There are no special cabinets in this reserve; the ornithological collection is kept in a metallic fireproof cabinet.